Within Teamwork Desk we have worked hard to keep the permissions easy to manage. There are two levels, Agent and Administrator. 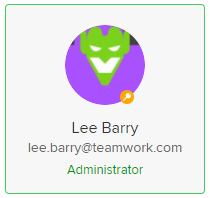 When viewing Users you will see a key icon on the profile image of an administrator. A regular user displays no icon on their image. An Administrator has full access to all areas within your Teamwork Desk account. This means that they will be able to see all inboxes on your account regardless of them having added it to their unified inboxes or not. Settings - All administrators can access the settings cog in the lower left. In certain cases where the permission for Agents has been set to manage canned responses and/or manage tags they will also see the settings cog in the lower left however they will not see any other items. Company Details - Only Administrators can edit company details. Reporting - All agents can access reporting however they will only be able to see the reports for the inboxes they are included in. Admins can view reports for all inboxes. Users - Only administrators can add new agents to the site. Inboxes - Only administrators can create new inboxes on your Desk site. Admins will also have access to all inboxes on your Desk site. Regular agents can only see the inboxes to which they have been added. In cases where agents have been given the permission to manage canned responses and/or manage tags, they will be able to see the settings cog to the bottom left of Desk.